The CBD Guru’s brings you a highly effective CBD Pain Relief Rub, a soothing gelatinous rub to topically apply to the affected area to ease neck and back pain, aching joints and muscle soreness/tenderness. We have combined the intrinsic anti-inflammatory and pain-relieving properties of CBD with a cold therapy rub to yield a product that is highly effective in pain management. 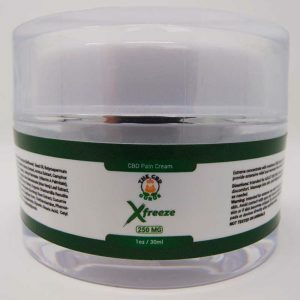 Pain Freeze Rub has been created with the purest CBD and other natural products such as Aloe Vera and Camphor Oil. Our natural product formulation helps kickstart and improve the natural healing process. This product is a combination of contentious manufacturing and 99% certified pure CBD. The other naturally sourced ingredients are: Camphor oil, Aloe Vera Extract, Arnica Montana Extract, Carbomer, menthol USP Natural 4%, FD&C Blue 1FC & Yellow 10, ILex Paraguanensis Leaf Extractlsopropyl Alcohol, Tocopheryl Acetate (Vitamin E), Methylparaben, Trietha, and Tea Trea Oil.